SACRED COW Animal Rights Peace Memorial acknowledges the injustices animals have endured and serves as an urgent call to humanity. 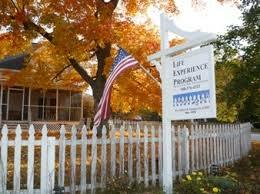 Since the founding of The Life Experience School, animal care and husbandry have been cornerstones to the curriculum and has guided much of the evolution of the School, and later the Peace Abbey for over four decades. It is a place of pilgrimage whose time has come, a cry that compels us to hear the voices of those who cannot speak on their own behalf. This Animal Rights Peace Memorial inspires us to respect and appreciate other animals, as well as to envision a peaceful and compassionate world for all the earth’s inhabitants. 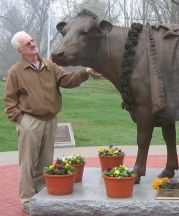 With the life-sized statue of Emily the cow, the Memorial is accompanied by bronze plaques that express the compassionate sentiments of such great thinkers as Albert Schweitzer, Mahatma Gandhi, Albert Einstein and contemporary animal rights activists John Robbins, Michael Tobias, Michael Klaper, Alice Walker, Fr. John Dear and many others. Lado Goudjabidze, an internationally acclaimed artist and sculptor, was commissioned to create the statue of Emily. Lado is considered a “national treasure” in his native Soviet Georgia where he was appointed to rebuild and beautify parks and cityscapes. All great social movements have their memorials: Abolition and Civil Rights, Suffrage and Women’s Rights, Labor and the Environmental and Peace Movements are among them. Until the unveiling of the Sacred Cow Animal Rights Memorial, the Animal Rights Movement stood alone without a symbol to represent humanity’s cherished dream of a cruelty-free world. 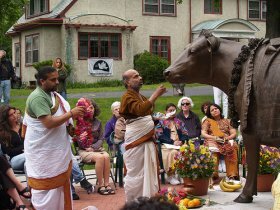 The SACRED COW Animal Rights Peace Memorial is a gift from The Peace Abbey to the world. Ali comforts Emily the Cow with a song.